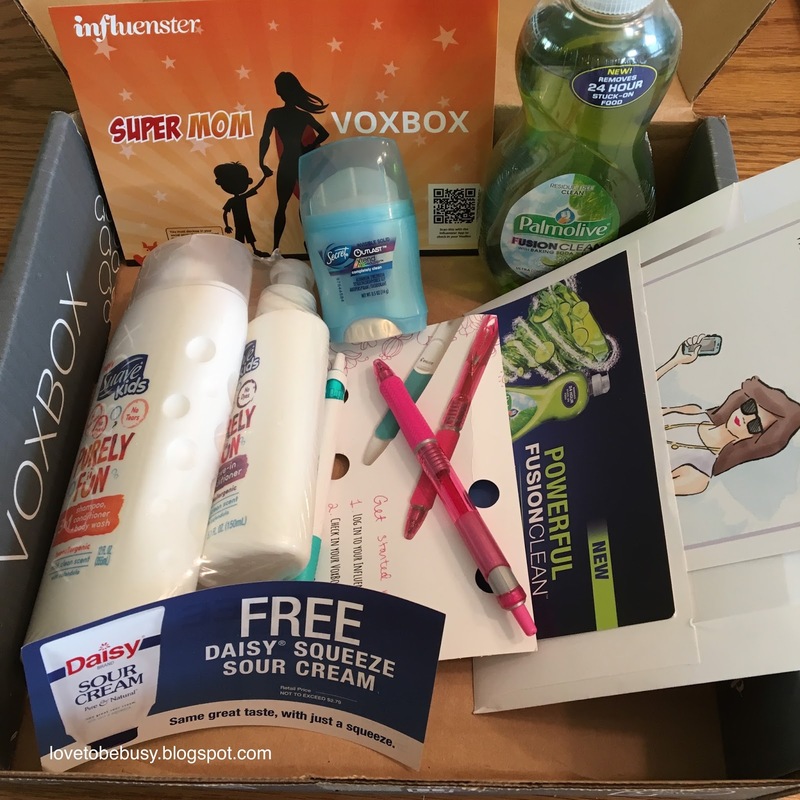 I was sent the Super Mom box from Influenster to review and try out. Palmolive fusion clean with baking soda and lime - This dish soap smells good but I don't know that it works better than other dish soaps. It claims to remove 24 hour stuck on food but I tend to wash my dishes right away or soak them so I can't speak to those claims. If this was on sale at the store I would buy it again but I won't go out of my way to hunt it down over another brand. Suave kids purely fun - My daughter was excited that something in the box was for her. She likes the shampoo and leave-in conditioner and I like that they are paraben and dye free. She has long hair that gets tangled with gymnastics chalk and is a mess by the end of the day. The leave-in has helped with the amount of complaining I get about brushing her hair. I would purchase both of these products for her in the future. Plackers flossers - These were also a kids product. They aren't even in the picture because she grabbed them right away. She loves the flavor and she says they are the perfect size to fit inbetween her teeth. I have yet to find these for her at the store but I have been trying to hunt them down. Pilot Acroball Pens - I am a pen addict! I love pens and colored pens and these write so nicely! I have enough pens to last forever but these are good ones and I would definitely buy them! Daisy Squeeze Sour Cream - Used this coupon to pick up some sour cream for baked potatoes one night. The squeeze part is definitely convenient for dinner items like baked potatoes and tacos. These boxes from Influenster are always fun to receive because I get fun new products to try out and let you guys know what I think. Definitely some good stuff in this Super Mom VoxBox this time!